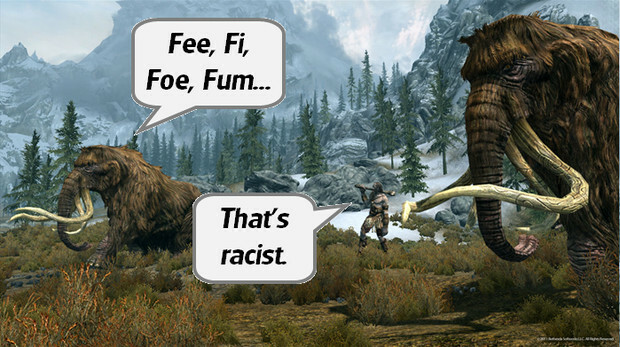 Skyrim is doomed. The “hero” I have created isn’t really focused on saving the day. They have spent more time picking flowers and catching butterflies than they have spent killing dragons. We’ve meandered into so many caves and caverns, distracted by so many side quests, that I’m not sure how far down the main story we’ve traveled. I and my created character are so easily distracted, that the final dramatic confrontation may never actually come to pass. Now that that shameful plug is over, let's discuss a few more aspects of Skyrim with odd ties to history. Firstly, let’s address a piece of history that is weirdly missing from the game. You would be quite right for believing that the spear is suited to group warfare. 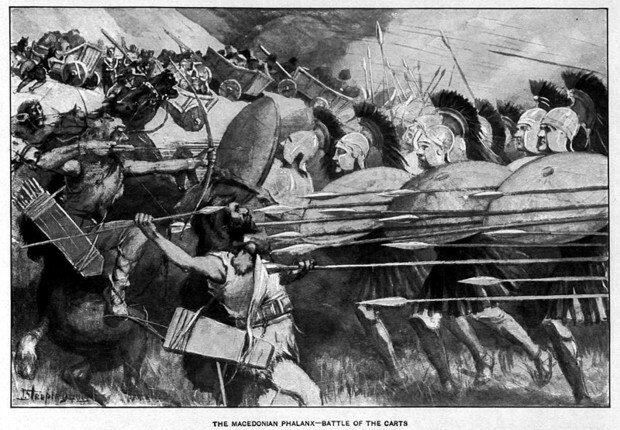 The ancient Grecian armies are infamous for their use of the Phalanx – a marching mass of shields and spears. Anyone who has seen 300 will know that the Spartans also liked to use this formation to their advantage (it probably never looked so oily and slow-motion however). 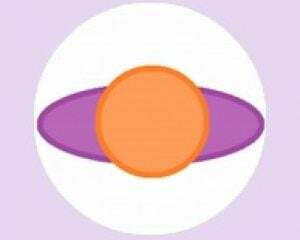 It’s very difficult to defeat a steadily advancing armour preceded by thousands of outstretched spear-points. What is less well known, is that the spear is a far more versatile weapon. Whilst the spear is a great ‘team weapon’, in the hands of any warrior this weapon can be used individually and successfully. In fact, there is a substantial amount of evidence that suggests that the spear was the most common weapon amongst Viking assailants. This weapon was, at the very least, as popular as the sword or the axe. It’s not difficult to understand why. In Skyrim, precious metals are practically leaking out of the landscape, but in reality the production metal weapons required precious resources, skill and time. Furthermore, Viking smithing was comparatively basic; swords were often made from strips of metal welded together. The spear on the other hand requires very little metal, and is much easier to mass produce. Whilst a sword (passed down the family line as a status symbol) may be sheathed and strapped to a Viking combatant, their primary weapon would be a stick with a pointy bit. When I first began to wedge history into my gaming blogs, a reader introduced me to YouTuber and weapons aficionado Skallagrim. His videos highlight misunderstandings of medieval weaponry, discusses the ‘realism’ of videogame weapons and demonstrates the art of ancient warfare. In the video shown below, he shows just why the spear was so popular throughout History. It’s historically unfortunate that the spear is absent from Skyrim, but it’s not hard to see why they are nowhere to be seen. No matter what weapon you are wielding in game, the fighting style is always the same. Your character adopts the “keep-swinging-until-the-thing-is-dead” combat style. With a spear though, the game would need a new set of fighting mechanics. The spear would have to be held out in front of the player, rather than held at eye heart in the usual FPS fashion. It’s up to the Modders to add those elements in. 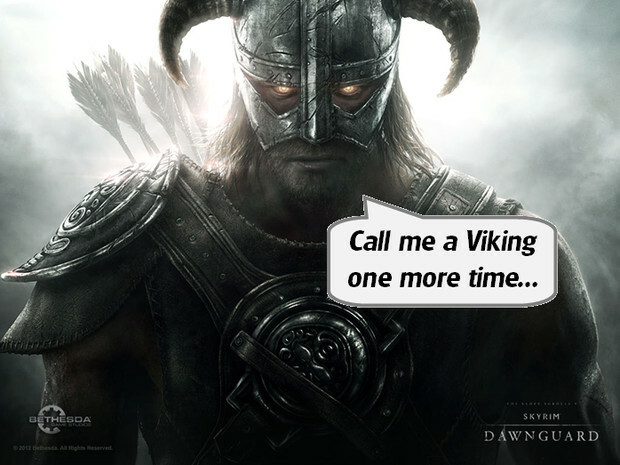 I pity the Skyrim Giants. For one thing, they’re not really that gigantic. Sure, they are taller than me or my player character, and could smash me into the ground for making fun of them (or occasionally smash me into the sky, which is one of my favourite glitches of all time) but they seem to lack the size and gravitas of the giants of fiction. However, that might not in fact be so inaccurate. So let’s once again steer away from all things historic and into ‘historic beliefs’. One thing that is ‘historically accurate’ about these creatures is there non-violent persuasion. They can mulch a bandit with one swing, but they usually require provocation. By exploring their habitat, we can see that their diet consists of skeever meat and cheese; breads made from human bone are non-existent. The mythological creature much more inclined to a people diet is the Ogre. 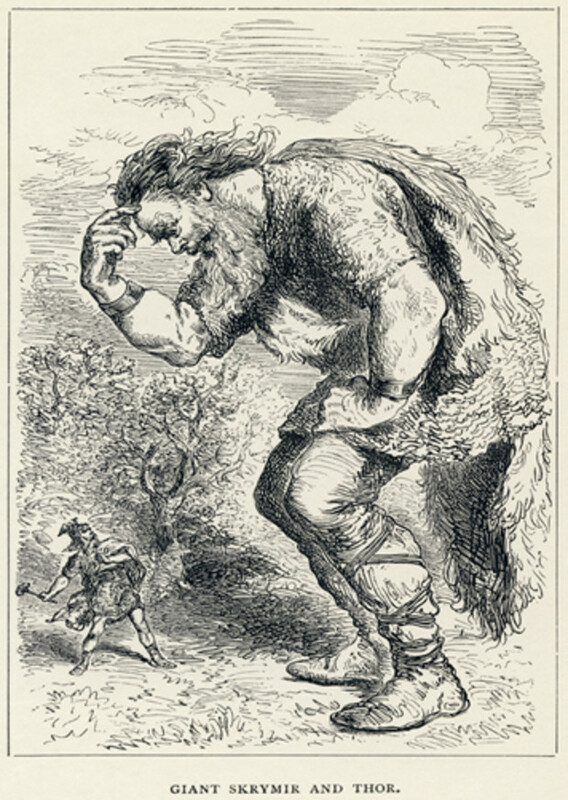 The word “Giant” is a blanket term for a lot of different creatures present in numerous cultural beliefs. Whichever form of giant is used in a video game would be accurate from one perspective but inaccurate from another. The ancient Grecian Titans come in two forms: the first were giant, awesome creations whilst the second were more humanoid in scale. In Nordic mythology, Jotun are only occasionally gigantic in scale, quite often described as a similar size as the gods that they were facing. Not only were they not as stupid as modern adaptations suggest, but their physical strength is what made then so dangerous, not just their scale. Which brings us to another discrepancy: in most forms, the giants are the opponents of the Gods. Gods such as Thor would have to use their wits and cunning to best this enemy. They are not the blundering oafs fairy tales would have us believe. In one poignant example, Thor is embarrassed by the actions of the giant “Skrýmir”. This particular giant is of the titanic persuasion. He’s so big in fact that Thor and Loki accidentally use the giant’s open mitten as shelter during the night. Skrýmir was actually quite friendly, and traveled with the Norse gods for a time, but his snoring was so loud that Thor tried to bash his brains in on more than one occasion. Thor fails miserably, and Skrýmir leaves them to it. I’m over-simplifying what is a wonderfully-weird story, but the point remains: Skyrim giants and Nordic giants are leagues apart. In Celtic folklore, we see a form of giant that more closely resembles those in Skyrim in scale and grey matter. Whilst most mythologies create giants as the arch enemies of the local deities, Celtic giants were used to explain away the old world. Buy the 12th century, very few people knew or cared how about the past. Celts from what is now the British Isles lived amongst the remnants of the Roman civilization. Stone walls, forts, aqueducts… these ancients objects stood as testament to an advanced society from long ago. How did these buildings come to exist? Well giants must have built them, of course! Now, before we poke fun at our ancestors, remember that we have supplanted ‘giants’ with ‘aliens’. We can’t understand how such amazing construction could exist at a time of such primitive technologies, so we invent a higher power who offered assistance. Authors and historians such as Saxo Grammaticus explained the existence of Roman architecture by reporting that mythological beings had a hand in the making. These giants were often of the same scale and stupidity as those in Skyrim. You and King Arthur both get to fight the same kind of giant. 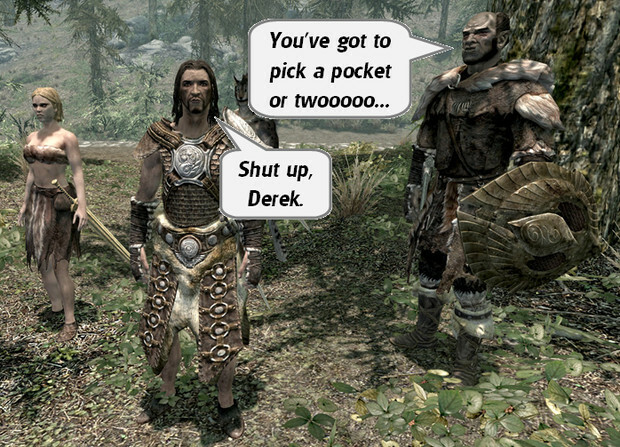 Players are often tempted to steal one or two items from the occasional store in Skyrim. By “one or two items”, I of course mean “everything”, and by “occasional store”, I naturally mean “everywhere”. If it isn’t background texture, it’s fair game, and it’s hard to resist the temptation to rob the world of all things precious when the vast majority of NPCs seem to have the same idea. In the previous segments, I have touched on historic crime and punishment. The execution scene at the beginning of the game, and the stocks/pillories found in at least one city in the game allude to a much broader and darker range of cruel outcomes for committing crime in History. Referring to King William I once more, we know of various gruesome punishments that the Norman ruler decreed. For example, should you be caught hunting on the grounds belonging to the Royal Family, you would not go to prison. Oh no no no, a message must be sent to all those who might also be looking to take the King’s stock. If it’s your first offense, the local law enforcement is charged with taking two fingers off the thief. You hunt where you shouldn’t, you lose two fingers. That makes sense, in a horrible way. Other peasants down on their luck will see those wounds and know not to break that particular law. The loss of two fingers will make hunting in the future very difficult. A harsh punishment, but at least no one would be stupid enough to do it again… except… that people did… because William issued a second punishment for the second offense. You kill one of the King’s deer for a second time, you don’t just lose another two fingers. Oh no no no no no… they take your eyes. I believe the apt internet meme at this point is “that escalated quickly” attached to an animal with a shocked expression. 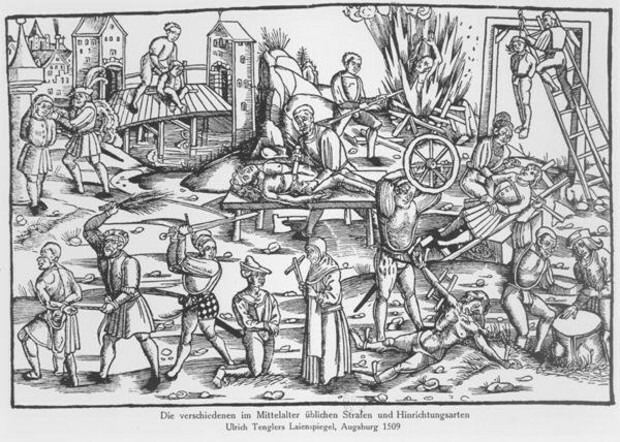 The fact is that medieval punishments were incredibly visceral because crime levels were so high. Thefts of property, livestock and even abductions were commonplace. Villages and cottages were so isolated from the rest of civilization that crime of all kinds could go unchecked for months before aid was sent. Traveling from town to town can be fraught with peril. From simple thieves to outlandish highwaymen, terrible deeds could be committed without immediate repercussions. Punishments were so incredibly brutal because prevention of crime was close to impossible. Disemboweling, castration, branding and amputation were all forms of punishment that existed because thievery was so prevalent. However, it must be stated that medieval punishments could be extreme in any situation. When you have a moment, Google the “Scold’s Bridle” and marvel at the lengths that a town could go to punish a woman who spoke her mind. In the future, I may well produce a Part 6. If I have the time to research, I’d love to learn more about the fine details of Norse mythology and compare it to the stories in Skyrim. This was something suggested by a few readers over the last few weeks – many commenters already began this comparison – and though I have started the reading, I’d need to get further into Skyrim and the research before I could make that happen. For now, I hope you have enjoyed Parts 1-5. It has been so much fun to write, and lovely to hear that so many gamers enjoy their history. I won’t stop writing the occasional history-gaming blog, and I see no reason to discontinue the “How Historically Accurate” inquiries. I’ve already had requests to comment on other Elder Scrolls games, and similar games like Witcher. I’ve recently started playing Darkest Dungeon, which is chock full with such delightful historic references. Feel free to make your own suggestions. If you want to add to, or amend, anything I have said in this blog please leave a comment. I never claim to be an expert, just someone who loves history and gaming in equal measure. I’d love to hear what you have to add.